I thought I’d let a buddy of mine (pictured to the right) have some airtime today with a post about the place we both currently call home, Gunnison, Colorado. The Gunnison Country is a great place for many outdoor activities such as mountain biking, rock climbing, hiking, fishing, and much much more. It is especially known for it’s fishing which rivals the best in the state of Colorado and around the world. I hope you enjoy and if you feel the urge come on out and see what Gunnison is all about. Next time you are thinking about taking a vacation to Colorado, consider checking out the southwest corner of the state. More specifically, stay in Gunnison or Crested Butte, Colorado and take advantage of the many different activities available in this area! These activities include: white water rafting, rock climbing, mountain biking, shopping, kayaking, fly fishing, hiking, 4-wheeling, and fishing on Blue Mesa reservoir! Blue Mesa, located fifteen minutes from Gunnison, Colorado, is the largest reservoir in the state and boasts some of the best kokanee salmon fishing in Colorado as well as the western U.S.! It also has trophy lake trout, brown trout, rainbow trout, perch, and the occasional pike. 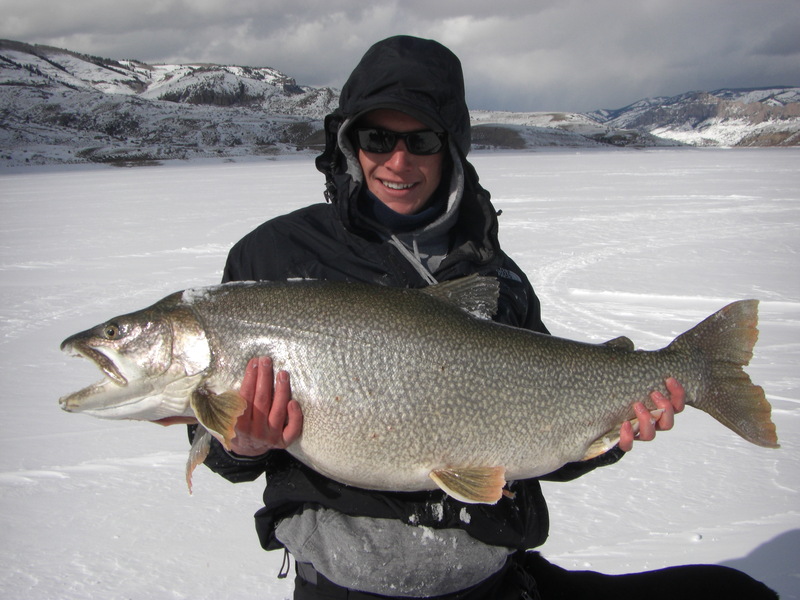 Blue Mesa holds a state record kokanee salmon and the state record lake trout, which exceeds 50 lbs! There are many great fishing opportunities at Blue Mesa reservoir and all of these opportunities are surrounded by the incredible scenery of the Dillion Pinnacles, West Elk Wilderness area, and the Black Canyon of the Gunnison! Kokanee salmon are a land-locked version of the sockeye salmon and are just as delicious! They make a fantastic mountain vacation dinner. These fish can be caught trolling or jigging from a boat and can put up quite a fight. A Blue Mesa fishing trip is a great addition to any summer or winter Gunnison or Crested Butte vacation and hiring a Blue Mesa fishing guide to get you into the fish is a great idea! One that comes highly recommended is Robby Richardson, owner and head guide of Sport Fish Colorado guide service. He has spent between 150 and 200+ days a year on the waters of Colorado over the last five years and Blue Mesa is his favorite place to fish! He will get you into the fish (And that’s no joke as you can see by the picture below), show you a fun time, and even fillet your fish up for dinner at the end of the day! 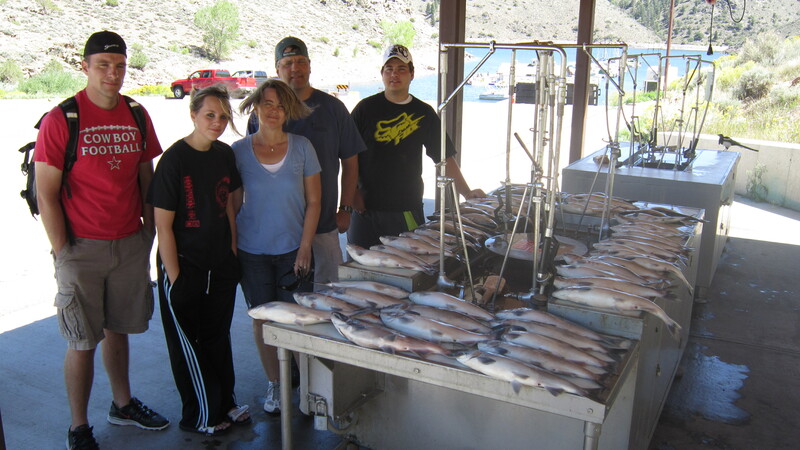 If you prefer to try a Blue Mesa fishing adventure on your own, all fishing equipment as well as a pontoon or aluminum fishing boat can be rented from Elk Creek or Lake Fork Marinas. You can also try fishing from the banks of Blue Mesa if you have your own equipment, but after the water warms in late spring, the fishing from shore can be a little tough. The Gunnison/Crested Butte area also has a lot of public access on rivers and streams in the area that can provide good fishing for rainbow and brown trout. Regardless of what type of fishing you prefer, give Blue Mesa and the Gunnison/Crested Butte area a try on your next Colorado vacation and hang on to that rod, you might be suprised at how good the action can be!